Earth is a balance of yin and yang, the feminine and masculine together, it is the element of the central palace. 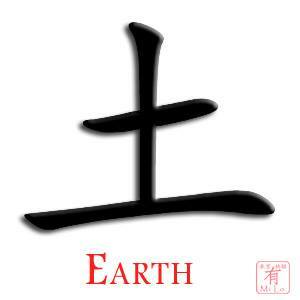 Earth is the element of 2 trigrams Kun and Gen; it is the only element to be represented in 3 palaces. 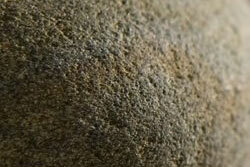 Earth represents grounding, protection, stability, and security. In the bagua, metal is associated with the divination figure 兌 Duì (☱, the lake or marsh: 澤/泽 zé) and with 乾 Qián (☰, the sky or heavens: 天 tiān). Wood is associated with 巽 Xùn (☴, the wind: 風/风 fēng) and with 震 Zhèn (☳, the arousing/thunder: 雷 léi). In view of the durability of meteoric iron, metal came to be associated with the aether, which is sometimes conflated with Stoic pneuma, as both terms originally referred to air (the former being higher, brighter, more fiery or celestial and the latter being merely warmer, and thus vital or biogenetic). In Taoism, qi functions similarly to pneuma in a prime matter (a basic principle of energetic transformation) that accounts for both biological and inanimate phenomena. In Chinese philosophy the universe consists of heaven and earth. The five major planets are associated with and even named after the elements: Jupiter 木星 is Wood (木), Mars 火星 is Fire (火), Saturn 土星 is Earth (土), Venus 金星 is Metal (金), and Mercury 水星 is Water (水). Also, the Moon represents Yin (陰), and the Sun 太陽 represents Yang (陽). Yin, Yang, and the five elements are associated with themes in the I Ching, the oldest of Chinese classical texts which describes an ancient system of cosmology and philosophy. The five elements also play an important part in Chinese astrology and Feng shui.